Springtime in Alaska is a funky season. The days have begun to lengthen noticeably, and temperatures, while still chilly, have managed to warm up enough that outdoor activity often requires several layers to add or take off as the mercury goes up or down. Spring also signals the arrival of early visitors to the 49th state, most of them stopping over in Anchorage with a desire to become acquainted the pathways and trails of Alaska’s largest city. Who can blame them? We’ve got hundreds of miles of trail – much of it perfect for families. 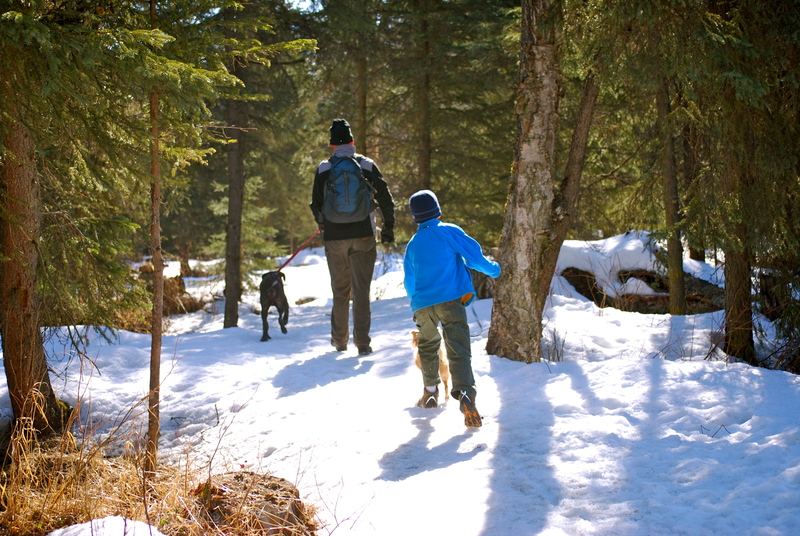 So, as we prepare to dust off the snow and ice for another year, here’s a selection of our favorite Anchorage hikes to welcome the season of sunlight, birds, and outdoor play. 1. Weather will be variable, chilly, and probably consist of rain, snow, wind, and sunshine. Thus, dressing for the worst, then ditching a layer or two along the way will serve you well. Take a backpack, extra clothing, hats, gloves, and water/snacks. 2. Trails are not always in their summertime pristine condition. Sometimes muddy, sometimes icy and snowy, trails must be treated with the utmost of care, especially those of the multi-use type (bike/hike/horse). 3. Animals are shaking off another long winter. Bears are waking up and roaming around in search of good things to eat; moose mothers are kicking out adolescent calves in preparation for new siblings, and even the occasional coyote or porcupine can be spotted among the spruce trees. Good to remember your critter-care, like our bear safety tips for families, found HERE. 4. Please pay all parking fees where applicable. Please leash dogs. Please be cautious and a good steward of our public lands. Kincaid Beach. 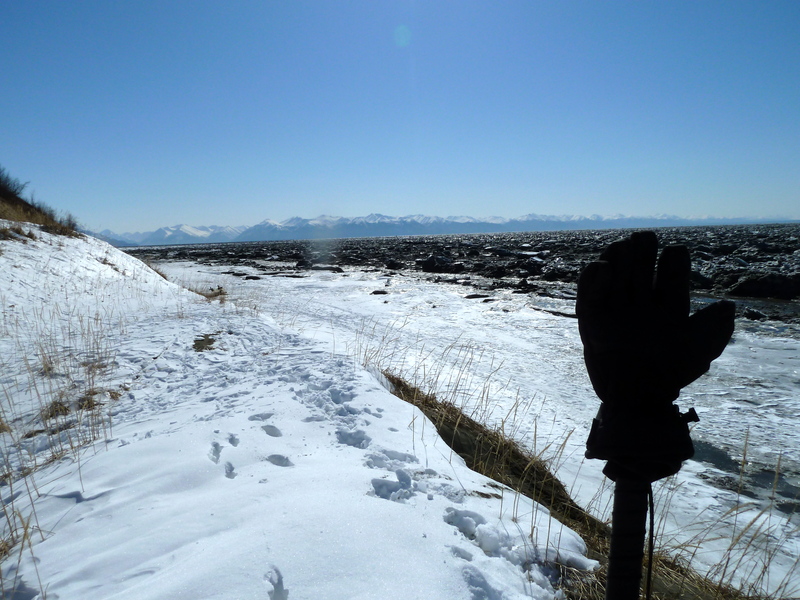 Truly the only beach in Anchorage with saltwater, softer sand, and views of Mount Susitna, Cook Inlet, and the mouth of Turnagain Arm, Kincaid Beach is a downhill hike of about a mile, then a short jog to the left, and down again. Popular with local families any time of year, this beach is not for swimming or sand castle building, though, so stick to the extreme shoreline and don’t go any further than the dry sand. That said, let kids explore the sand dunes upon which to jump and play, and enjoy a long sight line of your offspring. Great on a summer evening. 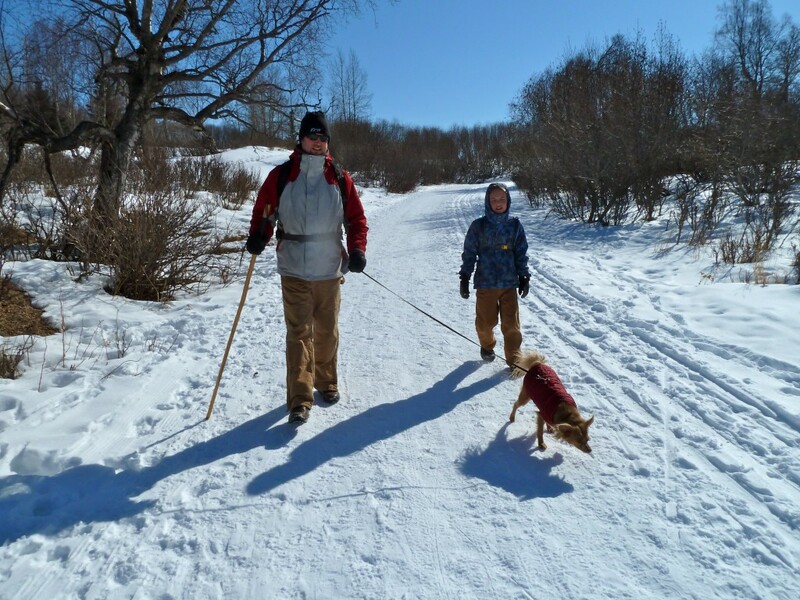 Kincaid Park is located in southwest Anchorage, and is open 10 a.m.-10 p.m. daily. Thunder Bird Falls. 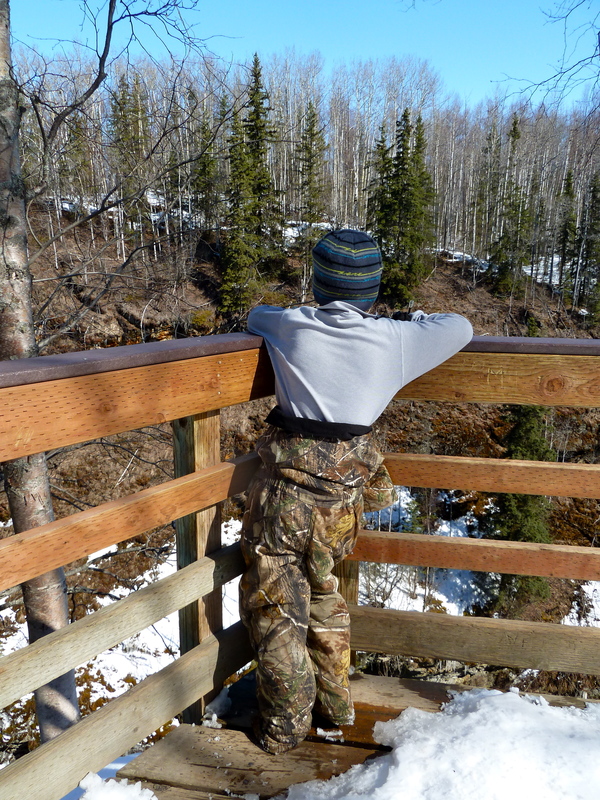 A short hike with a nice reward at the end, Thunder Bird Falls is located along the Glenn Highway, around Mile 25.5. Pretty accessible for jog strollers and young hikers, the entire round trip is only two miles and full of brushy birch and peek-a-boo views of the canyon below, until the end, when Thunder Bird Falls comes into view. We like the midway stop to learn a bit about the area, then have a snack at the platform near the falls themselves. 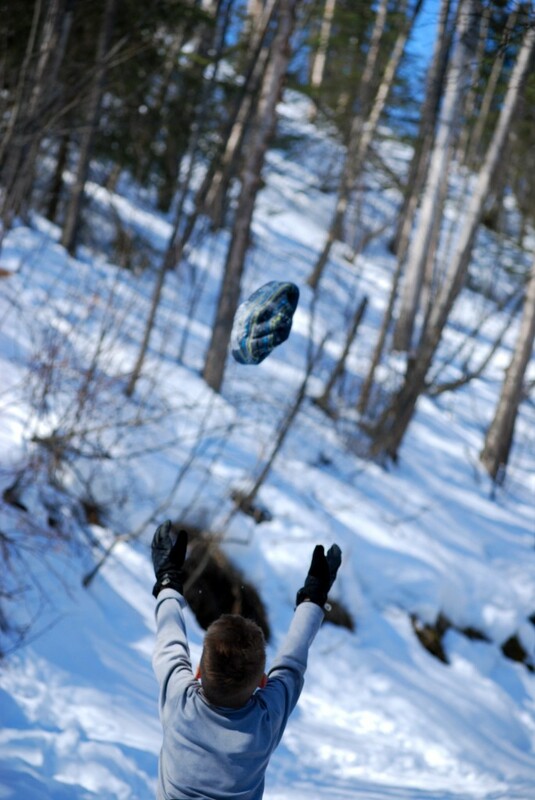 Can be buggy in the summer, so we like to hike this winter or spring (or autumn, for that matter). 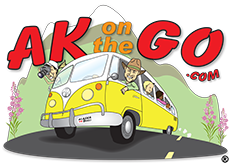 Remember to pay the parking fee for Chugach State Parks, or use your Alaska State Parks pass. Oh, yes, and for those wondering “Is it Thunderbird or Thunder Bird?” I can assure you my pals at Alaska State Parks confirmed it is indeed Thunder Bird, a name assigned many years ago. Campbell Tract. 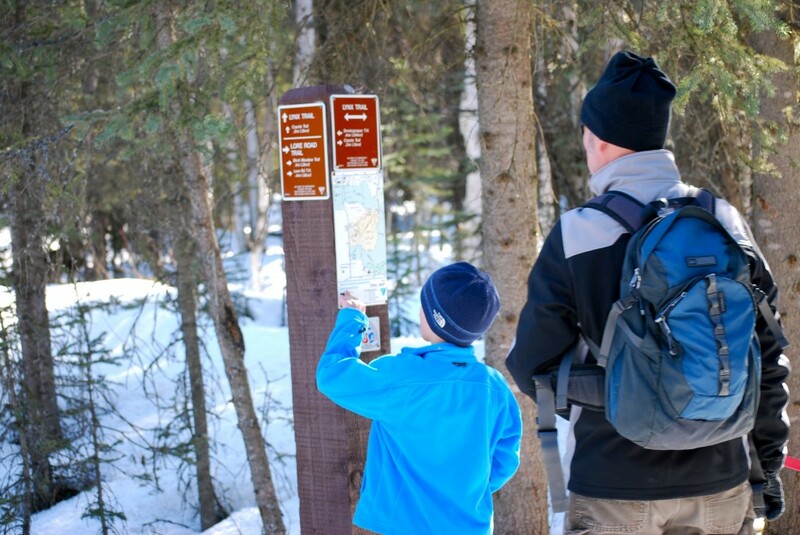 A staple of family outdoor recreational pursuits, the 760-acre Campbell Tract is multi-use heaven, with miles and miles of biking, hiking, and horseback trail systems that encourage city-dwellers to get out and enjoy the uniqueness of Anchorage. We usually begin our hikes at the Smokejumper Trailhead off Elmore Road in Anchorage, heading south along the Lynx Trail, then turning left at the Coyote trail junction to amble along the beautiful Campbell Airstrip, then returning via the Moose Track trail, a complete loop. Operated by the Bureau of Land Management, users can find a great map of all trail systems on the BLM website (link above). Do be aware that of the three trails listed here, this one has the highest concentration of black and brown bears, due to salmon-rich Campbell Creek. Make noise, travel in groups, carry bear spray, and keep kids close by. That said, it’s a gem of a destination, for an hour or an entire afternoon. With all this beauty and wilderness access, it’s a mystery that many visitors still defer their Anchorage hike possibilities, thinking they’ll accomplish that line item elsewhere. They’re missing the point. And the view. And the taste of wild Alaska, right here in Alaska’s largest city. Posted in Day Trips, Hiking in Alaska and tagged Alaska, Alaska Hiking, Alaska with Kids, Anchorage, Campbell Tract, Chugach State Park, Family Travel, Hiking Alaska with kids, Hiking With Kids, Kincaid Beach, travel Alaska. ← Springtime Activities in Alaska: *Special* for our USS Anchorage families!